Our new Chamber Investment Structure - choose the benefits that fit your business needs. 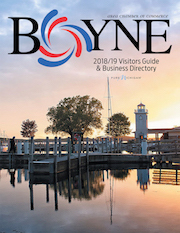 Visitors Guide – You are featured in 20,000 copies distributed in our area and highway visitor centers | Digital Visitors Guide * Advertising info. Online Directory – Includes your business listing, description, logo, picture, map, website and email links | Directory. 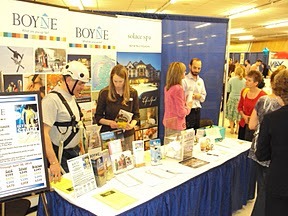 Business Expo – Crowd of 1,000 visits 75 booths in October at Boyne Mountain Resort. Exhibitors limited to Chamber members | Details. E-Newsletters – New members have their business profile with a photo printed in our e-newsletter that reaches 2,000 people. The newsletter includes weekly updates with business and community news. Send us your news! | Recent issues. Chamber Checks – Popular “Buy Local” campaign accepted at nearly every local business. Details. Constant Contact discounts - The Chamber uses Constant Contact to produce our popular weekly e-newsletters, and through a Partner Program, our members can get up to 25% off Constant Contact's services as well. Details. Leadership Charlevoix County – Grooming future leaders for our community | Details. Business Networking – Make connections at monthly Business After Hours and occasional | Details. Business Seminars - Learn business tips from experts at free or low-cost seminars organized by the Chamber. Hiring help - Looking for employees? Post your Job Listing here or email info@boynechamber.com. Referrals - From hundreds of phone calls and visitors to the Chamber office. Brochure displays – Free exposure in the Chamber office. Mailing list – Our members on address labels or an excel file – free and for members only. Special events - We support and sponsor events that attract thousands of visitors | Details. Ribbon cuttings, grand openings and open houses - we'll help you organize and promote. Insurance - Call one of our member insurance agencies - many give member discounts. > Not a member? Fill out our Online Member Application.